The Nones mark the ninth day before the Ides. On the Nones, the month's activities were formally announced and the people could make their plans, both for business and for festivities, accordingly. In Greece, this day was the Festival of Kore. Kore was also known as Cora, Core, Catherine, Persephone, and Proserpina. Persephone was a goddess associated with the Eleusinian Mysteries and was the daughter of Zeus and Demeter (Ceres). Her name means the Maid. Such was their happiness that Persephone was inseparable from her mother. Zeus, without Demeter's knowledge, gave her in marriage to Hades who opened the earth and snatched her while she was gathering flowers. In sadness at this loss and unable to get Hades to relinquish her daughter, Demeter let the crops wither. Zeus then arranged a compromise in which Persephone would spend part the year with Demeter and then four months with the grim lord. And so we have the winter when the plants will not grow. During the Alexandrian Koreion, a drama mystikon (mystical play) is performed in several acts on different levels, below the earth and upon it. The nocturnal rites of Kore/Persephone are celebrated in preparation for her return and the return of Spring to the world. During the Epiphanios (epiphany), people spend the night in the temple, singing to the accompaniment of flutes. A troop of torchbearers enters an underground chamber, sekos hypogaios. From this chamber, a naked, wooden statue is retrieved. On its forehead, hands, and knees are golden cruciform seals. This is placed in a litter and carried seven times round the inner temple. On this day on the island of Andros in ancient Greece, the water of a spring by the temple of Dionysos tasted like wine. This continued for a week although it only tasted like wine inside the temple. Blackburn(The Oxford Companion to the Year) notes that Aion (the miraculous child of Kore) was associated with Sarapis and Dionysus which may be why the liturgy for this day commemorates the miracle at the wedding-feast of Cana when the Christian Jesus turned water into wine. This is Wassail Eve in Europe. Wassail was a salutation offered on New Year's Eve and New Year's Day over the spiced-ale cup, hence called the ‘wassail bowl.’ It comes from the Anglo-Saxon, Waes hael, be whole, be well. This day is the Christian Twelfth Night, the last of the 12 days of Christmas, numbering from Christmas day through Jan. 5. Twelfth Night was -- still is -- believed to be the end of the Christianized yuletide season, the night of one more celebration before Christmas decorations come down, and the Christmas tree and other holiday greenery are removed from the home, on the next day. Local customs differ on whether the greenery must or must not be burned, though it is usually agreed that each household must keep a sprig of holly, ivy or mistletoe for good luck until the next Christmas season. Other Twelfth Night practices abound in the British isles, including the ceremonial sacrifice of the wren and the distribution of its feathers for the protection of Welsh sailors. To the Old Year adieu, Great joy to the new"
This twelfth night of the twelve days of Christmas is the official end of the winter holiday season and one of the traditional days for taking down the Christmas decorations (see also January 13 and February 1). This is also a traditional day for wassailing apple trees. In southern and western England, revelers gathered in orchards where they sang to the trees, drank to their health, poured hot cider over their roots, left cider-soaked toast in their branches for the birds and scared away evil spirits with a great shout and the firing of guns. This final day of the Christmas season, was considered the beginning of Carnival in Italy, where it was associated with jokes and tricks. In Tuscany, a man used to dress up like a witch (Befana?) and surround himself with befanotti, low-life characters wearing false beards and inside-out jackets. Booths were set up in the piazzas, offering toys and games. Vendors dressed up young boys like women, with blackened faces, caps on their heads, a long reed in one hand, a lantern in the other and hung them with baskets of oranges and golden pine cones. All of these resemble Saturnalian customs (December 17) and Twelfth Night does partake of the quality of Saturnalia with its emphasis on light-hearted fun, social satire and role reversals. 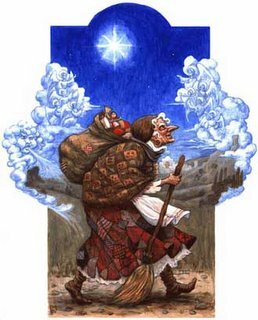 An alternate version of the the 12-day Yuletide cycle, running from Christmas to Jan. 5 -- rather than the traditional "Pagan" Solstice version of Dec. 20 - 31, ends today with the feast of the old Roman goddess Befana, the "Great Grandmother" who rides her broomstick through the world on this night, delivering gifts to good children. During the Christian middle ages Befana's ride was reassigned to a large male elfin figure (Santa Claus) who made his ride just before the start of Yuletide, on the night before Christmas. Befana became one of the cartoon witches who have survived in the popular imagination ever since. In Italy, families leave a focaccia for Befana by the fireplace and children hang their shoes and stockings by the chimney for her to fill with toys and sweets. If the children are bad they get garlic and lumps of carbone, but the charcoal is made of sugar. The story told of her is that she was too busy sweeping her house when the Three Kings came by and wanted her to go with them to see the Christ Child. When she set out later, she got lost and still searches for Him. Her name Befana derives from the holiday: Epiphany. Originally she was one of the numinous female figures so prominent at this time of the year, goddesses who are associated with both death and abundance. She has a negative side as well. Florentine children are told that she will poke holes in their stomachs if she is angry with them. She is sometimes portrayed as a bogeyman or associated with Hecate, Queen of the Night. She also represents the old year, like the Cailleach of Celtic tradition, the old hag who gives way to (or transforms herself into) the young maiden of the Spring. During the week before Epiphany, Italian children sometimes dress up and go in groups of three, carrying a pole with a golden star on top, and stopping at houses to sing pasquelle, little songs about the coming of the Magi. Sometimes they are given money, but other places they receive gifts of food sausages, bread, eggs, dried figs and wine. In some small rustic towns, the Nativity is re-enacted on Epiphany Eve with the newest baby in town taking the part of Jesus. On the eve of Dia de los Reyes, Latino children write a letter to the Three Kings, similar to letters written to Santa Claus, and set out cans of water and a decorated cardboard box full of grass for the camels. In Friuli, families gather around the hearth to watch the Christmas log burn. For centuries, bonfires have been lit to light the way for the Three Kings. The fires are called pan e vin, bread and wine, or vecja, old one. Boys run through the fields carrying burning brands, jump across the fires, and roll burning wheels down the hill, shouting out the names of their fiancées as a way to announce their engagements. The ashes from the bonfires are used to fertilize the earth and assure a good harvest. Carol Field(Celebrating Italy) describes an Epiphany procession in the town of Tarcento which ascends a hill to where a huge bonfire, made of sheaves of corn, brambles of brushwood and pine branches is set up. The fire, lit by the oldest man, ignites firecrackers and fireworks while bells ring in the town. The way the smoke blows foretells the prospects for the coming year: smoke blowing east predicts a year of abundance while smoke blowing west is a bad omen for the crops. People take home embers to fertilize their fields; the embers are magically said to transform into sacks of wheat. In some places, a straw effigy of the Befana is placed on the fire and burned as a way of getting rid of the old year. Sometimes chestnuts are thrown on the fire and roasted, as a symbol of fertility. Traditional foods served in Friuli on Epiphany Eve include mulled wine and pinza, a rustic sweet bread, made with corn flour (or sometimes rye and wheat), filled with raisins and pine nuts and figs, spiced with fennel seeds and shaped like a simple round or a Greek epsilon with three arms of equal length. It was once cooked under the embers. It is considered good luck to eat pinze made by seven different families. In the Roman Catholic calendar, this day is the feast of St. Simeon Stylites, so called because, after having prepared himself in youth with the practice of severe austerities, he made his way from his native Cilicia to Egypt and spent the last 37 years of his life standing atop a stylus-shaped pillar, sheltered only by his faith from the blazing heat and desolate cold of the desert. So determined was Simeon never to give himself the relief of sitting or lying down that in the end his death was apparent when he was seen not to have moved from a kneeling position for three days. The remnant of St. Simeon's pillar is preserved in a basilica erected by the Byzantine emperor Zeno in the 5th century. The Luis Bunuel film Simon of the Desert offers a profound and controversial version of the story.